Region: 35 minutes north of Santa Fe, Chimayo is just off of the "High Road to Taos". Just 35 minutes north of Santa Fe, you will find Casa Escondida B&B. It is secluded, serene and nestled on 6 acres in the awe-inspiring mountains of northern New Mexico. 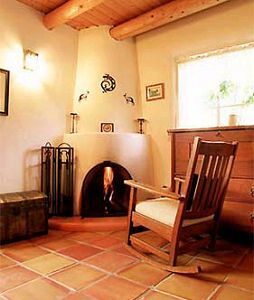 We offer 8 intimate and comfortable guest rooms (all with private baths) that are filled with handpicked antiques and accented in a rustic southwest style. The morning sun filters through the many French doors that surround our warm & inviting breakfast room, where you will be served a full, hot breakfast upon rising. After a busy day of sightseeing, have a relaxing soak in our outdoor hot tub. Many of our guest rooms feature kiva fireplaces, private decks, wood-burning stoves, over-sized tubs, private patios and much more. We are centrally located for many splendid daytrips & ski outings throughout all of northern New Mexico. Visit Santa Fe, Taos, Abiquiu, Bandelier National Park and much more from one central location!